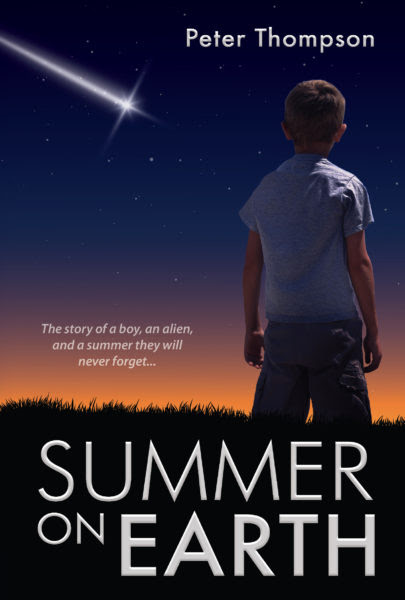 Summer on Earthblends humor, adventure and poignancy to create an unforgettable story about finding home. It was hotter than usual that night, and Grady couldn’t get comfortable, even with the fan on high. The June bugs thumped against the window screen, and the crickets chirped so loudly it sounded like they were right there in the room. He could hear the TV on downstairs, so he knew Ma was still awake. Ever since Dad died she’d stayed up late most every night. Grady just stared out the window and looked at the night sky. Where they lived, out in the country, there wasn’t much light at night and the stars stood out more than they did in the city. Grady tried to find the constellations his Dad had taught him, just letting his mind wander. At some point he started to get sleepy. But before he fell asleep, he saw a shooting star. And when he saw it, he made a wish. This is the story of how that wish came true.